Orangutans, already critically endangered due to habitat loss from logging and large-scale farming, may face another threat in the form of smoke from natural and human-caused fires, a finds. In 2015, Wendy Erb, a postdoctoral researcher in the anthropology department at Rutgers University–New Brunswick, was studying male orangutans in the forests of Indonesian Borneo when fires started. 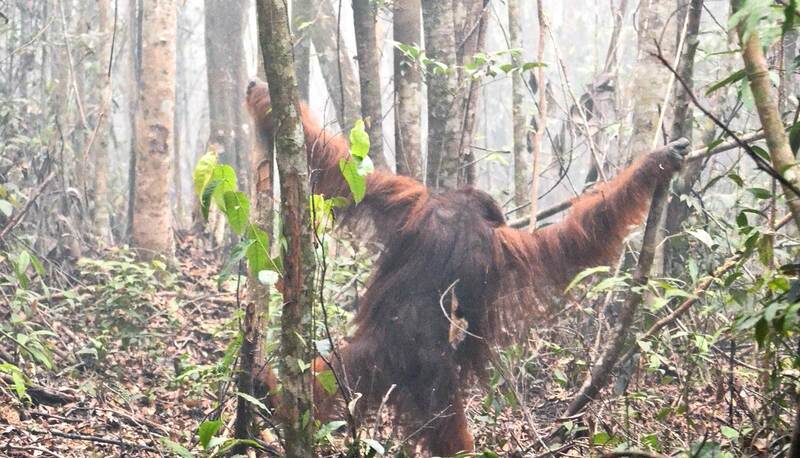 She and her colleagues at the Tuanan Orangutan Research Station continued working until they had to stop to help fight the blazes, which occur annually, often due to smallholder farmers and plantations clearing forests to plant crops. A few weeks into the fire season, Erb noticed a difference in the sound of the males’ “long call,” which scientists believe the animals use attract females and warn other males. “I thought they sounded raggedy, a little like humans who smoke a lot,” she says. Erb studied four “flanged” males, who weigh about 200 pounds and have large cheek pads. She awoke each day before dawn to collect their urine in a bag at the end of a stick she held below them. Analyzing their behavior and urine, the scientists discovered the big males traveled less, rested more, and consumed more calories. They also produced more ketone bodies, molecules made by the liver from fatty acids during periods of low food intake, which was unexpected because the apes were eating more, not less. Why were they burning fat? The only new element in the orangutans’ lives was the three months of fire and smoke. The forests’ natural surface consists of peat, which is flammable, allowing the fires to burn underground for weeks. The fires were worse in 2015 because of a strong El Niño effect, which brought with it a severe drought. Soil analyses suggest that wildfires have occurred in Borneo for millennia, but have become increasingly frequent and intense in recent decades due to deforestation and draining of peatlands. In 2015, Indonesia experienced the most severe fire activity and smoke pollution on record since the disastrous wildfires during the 1997 El Niño droughts burned some 24,000 square kilometers of peatlands (12 percent of the total peat area). Peatland fires destroy forest habitats, release greenhouse gases, and produce hazardous particulate matter, the leading cause of worldwide pollution-related mortality. Two independent studies estimated that the 2015 haze caused somewhere between 12,000 and 100,000 premature human deaths, but there has been very little research into the effects on wildlife populations inhabiting these burning habitats. The unexpected loss of nearly 100,000 Bornean orangutans from intact forests in Kalimantan between 1999 and 2015 indicates that habitat loss alone is not driving this critically endangered species’ declines. Increasingly frequent exposure to toxic smoke could have severe consequences for orangutans, other animals, and people, and this research highlights the urgent need to understand the long-term and indirect impacts of Indonesia’s peatland fires, beyond the immediate loss of forests and their inhabitants. Study coauthor Erin Vogel, professor of anthropology and the Tuanan Research Station’s co-director, says the next step is to analyze data from female and juvenile orangutans to see how the fires affected their health.